Our estate (under monument protection) with it's idyllic inner courtyard is located in the middle of the beautiful village called Lindheim. 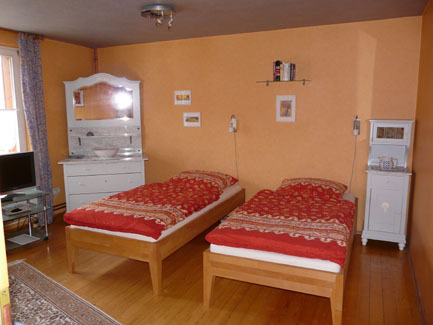 The first room is equipped with a double bed (1.8 x 2 m), the second room has two single beds. 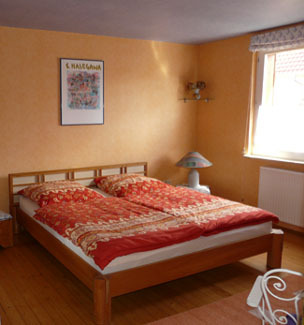 Both rooms offer seating accommodations and TV. 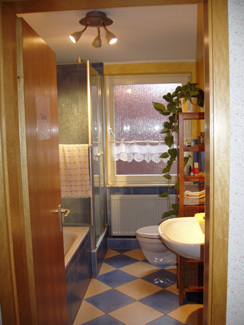 A bath and a toilet are on the same floor, the kitchen is placed in the ground floor. Our "petit parc" is situated behind the barn. It’s a beautiful garden similar to a park (approx. 1'000 m²). Big trees and idyllic places offer you serenity and relaxation. You simply can relax your mind. The volcano cycle track runs along our courtyard. The distance to the limes cycle track amounts to approx. 2 km.